The 2017 Porsche Macan Turbo comes equipped with a 3.6-liter twin-turbo V6 producing 400 hp or 440hp if you pick the new Performance package variant. Both versions have a 7-speed PDK transmission and a comprehensive standard specification list including an updated PCM, 19-inch wheels and 18-way adaptive and heated sports seats. A large range of optional extras include a Turbo package which heightens visual appeal and adds a sport exhaust which further complements the Macan Turbo’s impressive dynamic qualities. The Porsche Macan has been available for a few years now and continues to offer class-leading performance across the range. At the top of the tree sits the Macan Turbo and for 2017 it has moved the goalposts even further with the addition of the new Macan Turbo with Performance Package. There is now an upgraded PCM system and the huge options list allows for endless customization. The interior of the Macan Turbo is little different to the rest of the Macan range which is no bad thing. The high centre console and thick dashboard design wraps around you in a satisfyingly driver-centric manner and the standard sport front seats are some of the best in the business. The space in the back is somewhat tighter thanks in part to the tapering roofline where taller passengers may be admiring the simulated suede headliner a bit too closely. Fitting taller items in the cargo area is also easier in some competitor’s products. Fit and finish is very good as one would expect and the premium feel extends to the minor switchgear. 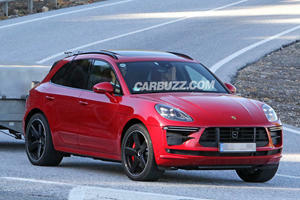 When it comes to emulating a sports sedan or coupe the Macan is the only SUV around that even comes close. To mask its height and weight it has a number of electronic aids to call upon, however this necessary layer of technology numbs feedback just in case you were expecting the same tactile experience as Porsche’s lighter and lower 2-door offerings. If you happen to wander onto a race course the rear-biased all-wheel drive system still allows for some hooliganism and even the standard steel brakes are impressively fade free after heavy use. 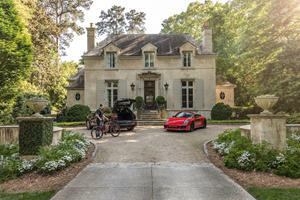 Despite its obvious sporting bias, the ride remains composed on all but the worst road surfaces in everyday driving. The 400 horsepower Macan Turbo pummels the 60 mph benchmark time into submission in a serious 4.6-seconds or 4.2-seconds with the optional Sports Chrono Pack. If you opt for the Performance Package Sports Chrono is included as well as an additional 40 hp which means a 4.2-second 0-60 mph time. All this is made possible by the impressive twin-turbo 3.6-liter V6 squeezed in under that sculpted hood, in standard form it tortures the tires with 406 lb-ft of torque over an impressively wide rev range. Mated to a 7-speed PDK transmission, gear changes are lightning quick too. Standard specifications have been improved for 2017 and as befits the top range model, the Macan Turbo comes well specced. 19-inch wheels, adaptive headlights, 18-way power seats, leather upholstery and an upgraded 14-speaker Bose sound system as well as navigation all make it on to the standard spec sheet compared to what you would usually find on a lesser Macan. That is a good thing because if you are not careful the optional extras on a Macan Turbo can add up to an eye-watering bill. 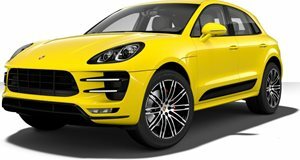 The biggest new addition for 2017 is the aforementioned Macan Turbo Performance package, it is listed as a separate model from the Macan Turbo but is outwardly unchanged. What you get is an extra 40 hp, a lowered ride height and air suspension, power folding mirrors and a heated steering wheel. The Premium Package Plus comes with Porsche entry and drive, lane keep assist, seat ventilation for front seats and auto dimming mirrors. The Turbo Exterior package is unique to these two models and offers 21-inch wheels, LED headlights, sport exhaust system and a number of high gloss black design touches. Individual options include a panoramic sunroof, upgraded Burmester sound system along with a vast range of customizable interior fabrics and materials. 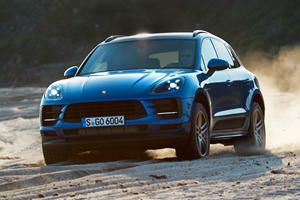 The Macan Turbo has reaffirmed its position at the top of the mid-sized luxury SUV pecking order for 2017. The performance package elevates its capabilities another notch and thanks to detail upgrades and a host of desirable if pricy options, it remains as appealing as it did at launch. Нашел в интернете классный блог про направление Купить аккумулятор Topla.